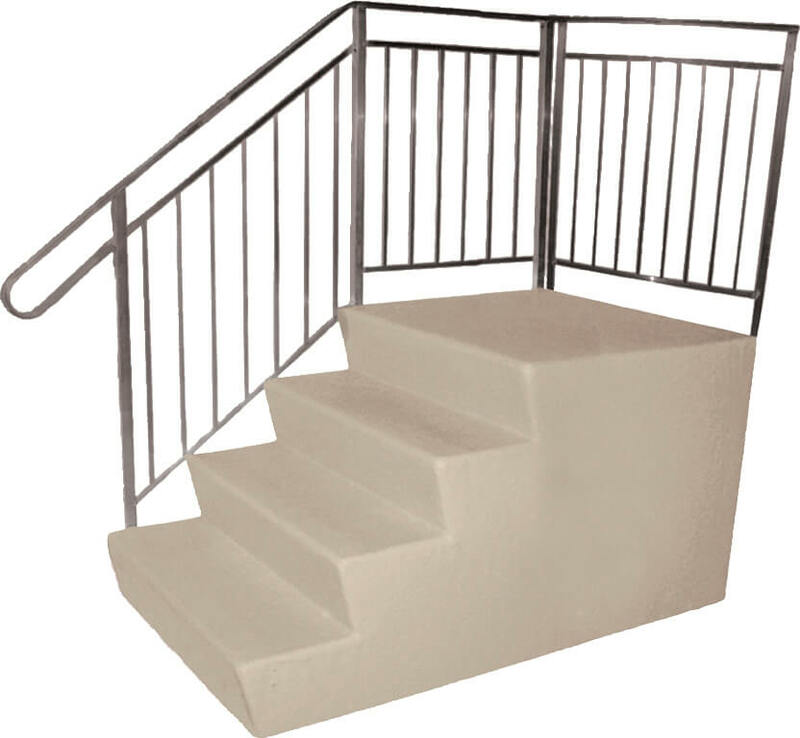 Home > STEPS & RAILS > Fiberglass Steps | 38" x 38"
Use this popular fiberglass step when you prefer a parallel approach. Code approved in most areas. Fiberglass Steps | 38" x 38"
Most people know StyleCrest as the leading manufacturer of high performance skirting, but StyleCrest actually started in 1970 by making steps. They decided it was time to rethink the whole idea of steps and what they mean to the appearance of today’s more attractive manufactured homes. So they did extensive research on design, safety, colors, surfaces and styles. The result is the next generation of steps that are safer, more attractive, and easier for you to sell and install. Our Dura-Grip II™ fiberglass step has a textured, slip resistant stone-like surface that gives better footing in all weather conditions. The receding riser gives the step 12” of surface for the foot and gives the unit a contemporary look. Mounting rails is a snap. Just align the rail posts with the pre-drilled holes (that have steel sleeves so no drilling is required), and tighten the bolt. Takes 5 minutes, tops! Deluxe extruded aluminum railing add strength and safety. All StyleCrest rails meet or exceed most federal, state, and local code requirements. Contact Capitol Supply & Service with code requirements for your area. Shown with Deluxe Side and Back Rails which meet B.O.C.A. Code. Note: Side and back rails must be ordered separately. Rail bumpers standard on all rail options. 16" x 38" x 38"
24" x 38" x 38"
28" x 38" x 38"
32" x 38" x 38"
35" x 38" x 38"
40" x 38" x 38"
© Capitol Supply & Service 2017. All rights reserved.